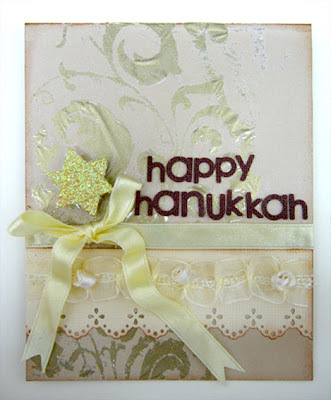 Hanukkah is just around the corner, but there's still time to create some last minute cards! These are really clean and simple cards without a busy design or too many embellishments. Hanukkah is all about light and the best color for light is yellow. Both cards have yellow colors and shiny sparkling motifs. The first card has a simple light background with a gold rub-on. I added a punched border with a white flowery ribbon. Since Hanukkah is all about light I used a soft yellow ribbon for the bow and a gold sparkly embossed star as a shiny embellishment. 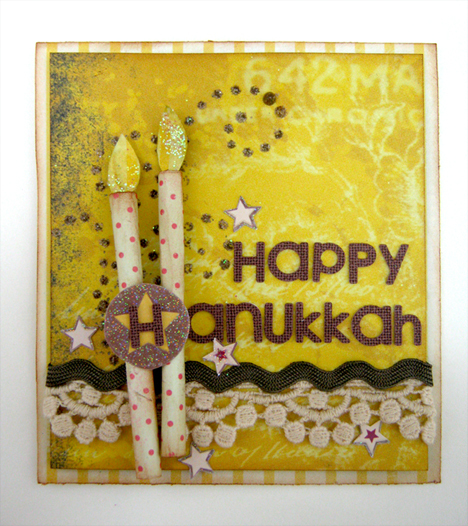 The second card is shinier and has a yellow background with a flame like stickles dots swirl and ribbon's border. I created two candles by rolling two pieces of paper to a pipe shape and added a little glittered flames on top. 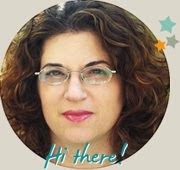 I adhered the H on a glittered yellow star to emphasize the title. For a finished touch I added a few small stars.